The U.S. Army is abandoning the politically correct mandates of the Obama administration and will focus on “readiness and lethality” within combat units. Army Rangers in training at Fort Benning, Georgia. The Army is making previously mandatory training on transgender transition, pre-deployment cultural awareness skills and courses on media awareness optional, according to a series of service-wide memorandums approved by Army Secretary Mark Esper and Chief of Staff Gen. Mark Milley and obtained by The Washington Times. “The Army’s regulations and policies that deal with training were pretty settled, and there were not a lot of detractors to it. 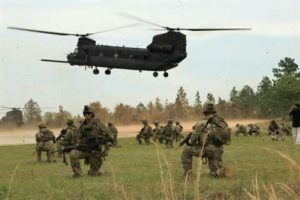 … It was all the other [training] requirements that we levied on ourselves, or we had levied from other places” that led to the increasingly cumbersome approach to combat readiness, said Col. John O’Grady, chief of the Army’s collective training division. Those mandated training requirements “served as barriers to maximizing time … to build readiness and lethality” within combat units, O’Grady told the Washington Times. Army officials issued the new training guidelines to bring the Army more in line with the Pentagon’s new National Defense Strategy, Col. O’Grady said. The time soldiers spend in infantry training will also be extended. Soldiers graduating from the nine-week basic training course will now spend an additional two months in “advanced individual training” before heading to their first duty stations, the new guidelines said, adding that the previously mandated training material will now be carried out at the discretion of unit commanders. “One of the things this did is reinforce to commanders out in the field that you have the authority and responsibility to ensure your units are as highly trained as humanly possible” to carry out combat operations, O’Grady said. Army officials said the decision to eliminate mandatory training for transgender transition was not made for ideological reasons, but because the effort had already run its course. Judge Marsha Pechman of the U.S. District Court for the Western District of Washington last month became the latest judge to block President Donald Trump’s ban on transgender troops in the military.